There are many different models that people can follow to achieve their goals. Here is one approach. People start from their destination and clarify the goal they want to achieve. They then open their minds and embark on raising their awareness about how to reach the goal. They gather information, learn from experts, study best practice or whatever. 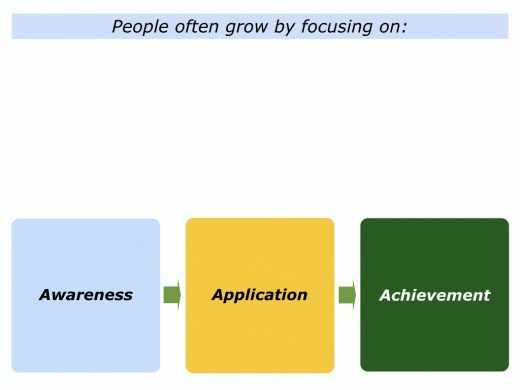 Many employers, for example, want their people to develop their awareness, but they actually pay for application and achievement. 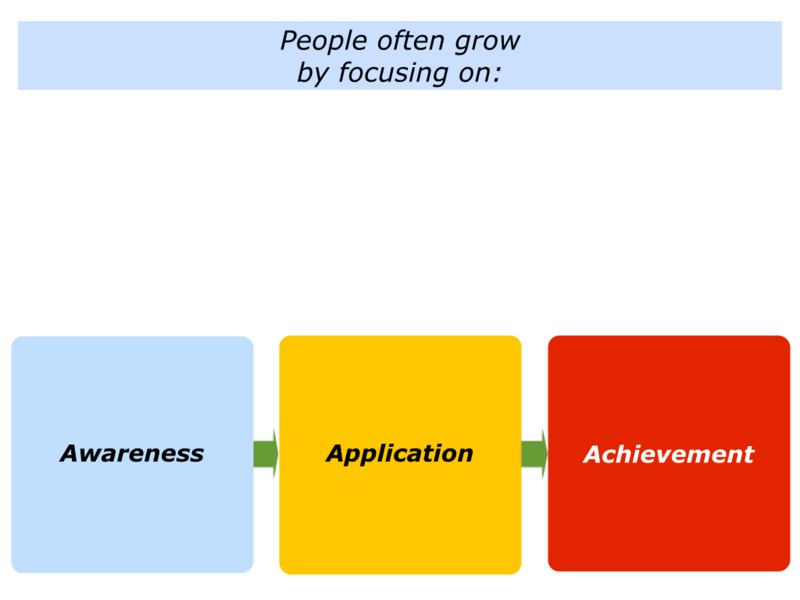 People who apply their learning – and who are persistent – are more likely to achieve their goals. Let’s explore how this works in practice. Looking back on your own life, can you think of a time you went through these stages? You may have wanted to improve your health, develop a skill or reach a specific goal. “This is what happened for me,” said one person. “During a health check I got some news about warning signs of a particular illness. “Like many people do in this situation, I searched the web for information. This led to me finding one of the world’s leading authorities in the field. Good sports coaches follow these steps when educating their teams. They start by explaining the goal to achieve. They then work with the athletes to expand their awareness regarding the game plan to follow to achieve the goal. Going out onto the field, the coach encourages and educates the athletes to apply the approach. After much work, the athletes implement the plan properly on the practice field. Finally comes the true test. They must apply the game plan in the actual games. The athletes aim to do this successfully and achieve the specific goal. 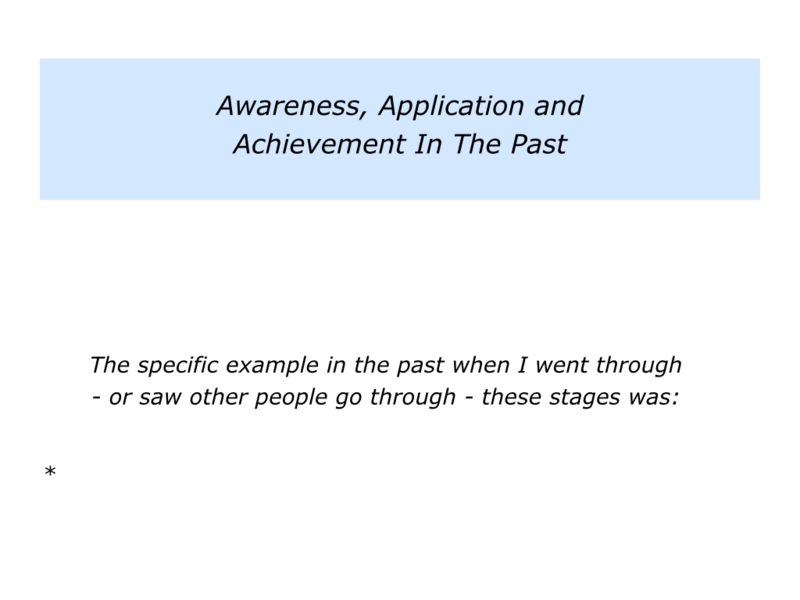 Describe a specific example of when you went through – or saw other people go through – the stages of awareness, application and achievement. Describe the specific things that you did – or saw other people do – to go through these stages successfully. 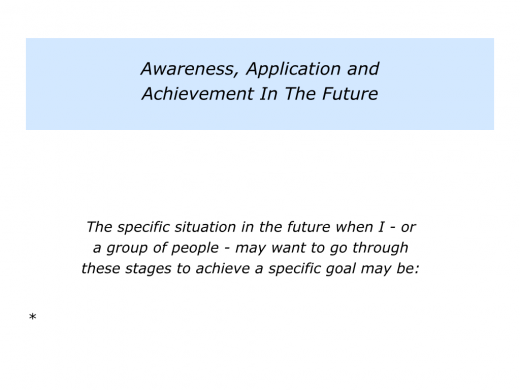 Looking to the future, can you envisage a situation where you might want to go through these stages successfully? Alternatively, you may want to help other people to do this to achieve their goals. If you work in the coaching profession, for example, you may be judged by your ability to provide people with practical tools they can use to deliver success. One business leader expressed this sentiment in the following way. “People can surf the net and see these principles repeated time and again. There are thousands of experts on organisations, for example, who want to market their latest idea. This was a lesson I learned during my early days working with young people in therapeutic communities. The programmes were judged by whether or not the young people stayed healthy. This meant them doing things like taking responsibility, staying off drugs and living within the law. To provide an encouraging environment for young people who wanted to stay healthy. To educate the young people by providing practical tools they could use to stay healthy. To enable the young people to deal with the daily challenges they faced when aiming to stay healthy. If you want to know more about the approach, here is the first part of a BBC TV programme about the work. The session was filmed in 1972. The funding for therapy programmes depends on their application and achievements – not the number of therapy sessions or people having increased awareness. They are judged on whether or not such programmes deliver the goods. 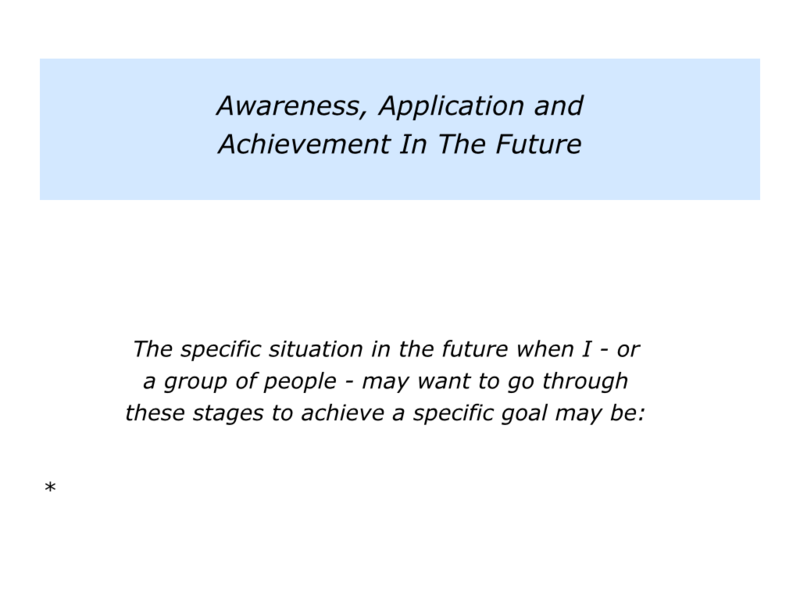 Looking to the future, can you think of a situation where you would like to go through the steps of awareness, application and achievement? Alternatively, you may want to lead a team that wants to provide better customer service, solve a problem or achieve peak performance. You will start by being crystal clear on the goal to achieve. This may be to take charge of your health, develop a skill, improve a business or whatever. 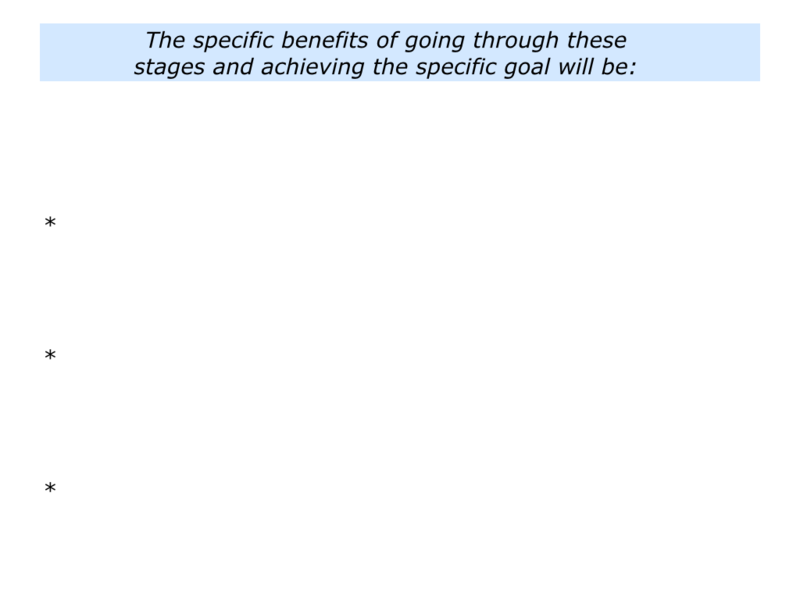 Bearing the goal in mind, you will then go through the stages to achieve success. 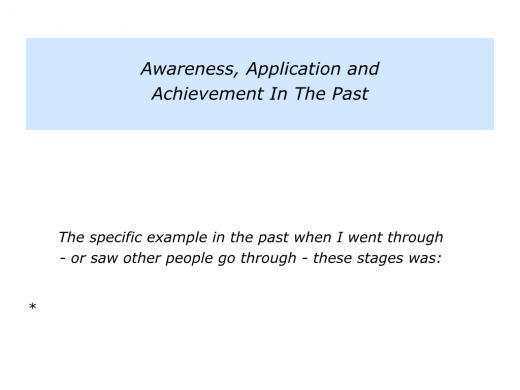 Describe a specific example where you – or a group of people – may want to go through the stages of awareness, application and achievement. 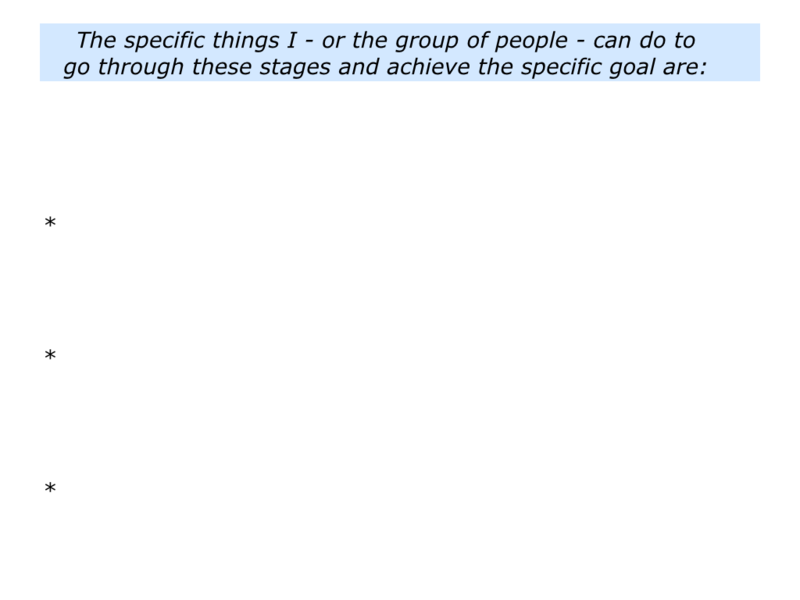 Describe the specific things that you – or the group of people – can do to go through these stages successfully. 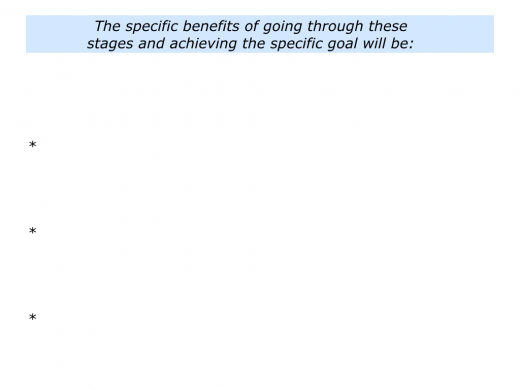 Describe the specific benefits of going through these stages and achieving the specific goal.